These Nutella Stuffed Cookies are a delicious double chocolate chip cookie that’s laced with Nutella and stuffed with a gooey hazelnut chocolate filling. Anyone obsessed with the chocolate hazelnut spread will go crazy for these ooey gooey Nutella Stuffed Cookies! Chocoholics listen up: these indulgent morsels will become your new favorite treat! 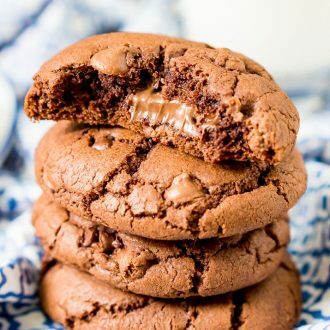 In this recipe, chewy chocolate cookies filled with chocolate chips surround a rich Nutella center — yep, these are rich! In order to “stuff” the cookies, simply put a spoonful of Nutella in the middle of a circle of dough, fold the sides over the filling, then chill for half an hour. When you pull the batch out of the oven and bite into a warm cookie (careful, they can be hot! ), the center will be perfectly creamy. These treats are full of tantalizing textures that’ll make you crave them any time of day. With chewiness from the cookies, crunchiness from the chocolate chips, and of course, that gob of smooth Nutella stuffed in the center, every bite is as delicious as the last. 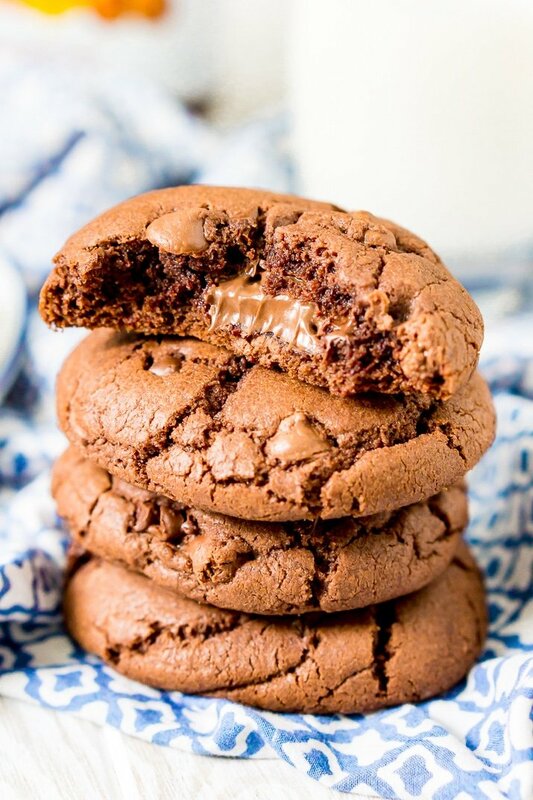 Nothing conquers chocolate cravings like these Nutella Stuffed Chocolate Cookies, especially when you wash them down like an ice-cold glass of milk! These treats are decadent, so it only takes a couple to get your chocolate fix. After a long afternoon, you can beat the midday crash with a couple Nutella Stuffed Cookies and a mug of coffee. The boost of sugar is enough to keep you going, and the extra caffeine will help you get through the rest of your day. 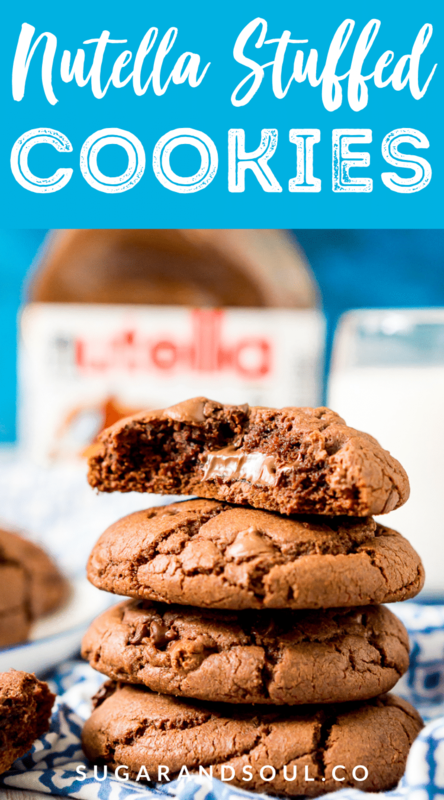 Almost everyone I know is a fan of Nutella, so I love making these cookies for crowds. Plus, when it comes to big gatherings, I always try to prepare at least one hand-held dessert that doesn’t require utensils, especially if some of the guests are kids. Summertime usually brings a slew of cookouts, graduation parties, and other special events, and this is the perfect recipe to share with all your loved ones. After all, have you ever met anyone who doesn’t love Nutella? If you’re looking for a crowd-pleasing dessert, bake some Nutella Stuffed Cookies to delight friends and family members of all ages! Just make sure you make a couple batches because everybody’s going to want at least one. Pin these Nutella Stuffed Cookies for Later! It is a deliciously sweet chocolate and hazelnut spread from Italy that has now taken the world by storm. It can be used much like peanut butter in all different kinds of recipes or used alone on toast or crepes! How Do You Make Nutella Stuffed Cookies? 1. Begin by lining a baking sheet with wax paper and use a teaspoon to turn 3/4 cup of the Nutella into 24 teaspoon-sized dollops. Because of the nature of the Nutella, dollops do not need to be exact measurements or all the same size, you just need 24. Freeze for 30 minutes. 2. While Nutella is freezing, preheat the oven to 350 degrees F and line cookie sheet with parchment paper and set it aside. 3. Next, cream the butter, remaining 1/2 cup Nutella, and sugars together until smooth. Then add in the pudding, eggs, additional egg yolk, and vanilla and beat for about one minute on medium speed. 4. Then in a separate bowl, whisk together the flour, baking soda, and salt, then add the dry ingredients to the wet ingredients a ½ cup at a time and mix until combined. Finally, mix in the chocolate chips just until incorporated. 5. Once the dough is ready and the Nutella dollops are frozen, use a medium cookie scoop to scoop out a scoop of the cookie dough, press a Nutella dollop into the flat part of the dough, scoop out another scoop and press the flat side against the other ball of dough, sandwiching the Nutella between them. Roll between your hands to seal the Nutella in. 6. Place cookie dough balls 2 to 3 inches apart on the prepared cookie sheet and bake for 13 to 15 minutes. Cookies may require a little longer than this depending on your oven, the center will be gooey because of the Nutella but the edges should start to crisp up and the top should begin to crack. 7. Allow the cookies to cool on the baking sheet for a couple of minutes before transferring to a cooling rack. These Nutella Stuffed Cookies are a delicious double chocolate chip cookie that's laced with Nutella and stuffed with a gooey hazelnut chocolate filling. Line a baking sheet with wax paper and use a teaspoon to turn 3/4 cup of the Nutella into 24 teaspoon-sized dollops. Because of the nature of the Nutella, dollops do not need to be exact measurements or all the same size, you just need 24. Freeze for 30 minutes. While Nutella is freezing, preheat the oven to 350 degrees F and line cookie sheet with parchment paper and set it aside. Cream the butter, remaining 1/2 cup Nutella, and sugars together until smooth. Then add in the pudding, eggs, additional egg yolk, and vanilla and beat for about one minute on medium speed. In a separate bowl, whisk together the flour, baking soda, and salt, then add the dry ingredients to the wet ingredients a ½ cup at a time and mix until combined. Mix in the chocolate chips just until incorporated. Once the dough is ready and the Nutella dollops are frozen, use a medium cookie scoop to scoop out a scoop of the cookie dough, press a Nutella dollop into the flat part of the dough, scoop out another scoop and press the flat side against the other ball of dough, sandwiching the Nutella between them. Roll between your hands to seal the Nutella in. Place cookie dough balls 2 to 3 inches apart on the prepared cookie sheet and bake for 13 to 15 minutes. Cookies may require a little longer than this depending on your oven, the center will be gooey because of the Nutella but the edges should start to crisp up and the top should begin to crack. Allow the cookies to cool on the baking sheet for a couple of minutes before transferring to a cooling rack.